by REV. FATHER MARIE EDOUARD MOTT, C.M. "How, Sister?" "Through the Green Scapular." "What is that?" "Please, Sister." With that she put one over my head. A feeling of tremendous confidence poured into me and the bleeding stopped. Two days later, in the X-ray room, they asked me when the hemorrhage had ceased. When I replied that it was a matter of a couple of days, they expressed great surprise. During May I asked the rector of St. Patrick's, Toronto, for permission to speak of it at the Wednesday devotions. I had a thousand Green Scapulars on hand, but no one thought that more than thirty would be asked for. The thousand were gone the first morning. The room where we distributed them was so jammed that I feared someone would be injured. The rest of the day I was besieged on all sides for more. Foolishly, I showed the one I had for myself and it was quickly snatched from my hand. They will repeat the description of the Mother of God, standing in all her beauty before the young novice, and returning again and again until the Scapular was made and distributed. Telling the young Sister that the Scapular could be blessed by any priest, carried or worn on the person, even left in one's room. 3. Pray, at least daily: "Immaculate Heart of Mary, pray for us now and at the hour of our death." in direct proportion to the degree of confidence in me which the user has." Oh most Merciful Father, today I beg Thee to accept my sincere act of love in consecrating my entire life to Thy Son's most Sacred Heart. I do this not alone my dearest Father, but through the Immaculate Heart of Mary, Queen of the Green Scapular. With her heart so pierced with the seven sorrows, at the beginning of Thy Son's life until His tortuous death, she cries daily for those who choose not to love Thy Divine Son, Jesus. Even today with so many souls choosing to spend their eternity in Hell, she longs for our intercession to bring others to know and love our God: the Father, Son and Holy Spirit. We ask then Almighty Father that Thou wouldst permit us to place all these souls in Mother's hands, those whom have touched our life in some way. We wish to consecrate today our family members, friends, yes even our enemies; to the Sacred Heart of Jesus. We know that Thou, our Divine Majesty, wilt refuse Thy Son nothing, and that Thy beloved Son can refuse His Mother nothing when it comes to the salvation of souls. 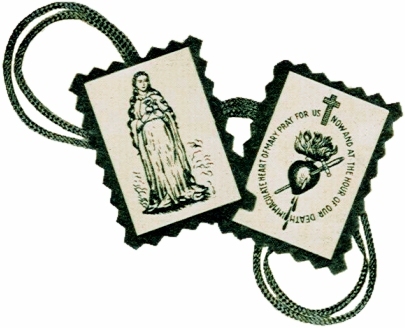 I make this act of Eternal Consecration only once, my Merciful Father, and beg Thee to apply its merits to those whom have their names placed on a Green Scapular. We offer for those souls Thy Son's most beloved Body and Blood in the Holy Eucharist, along with the Rosaries, prayers, joys, sacrifices and sufferings of each day, past and present until the end of our lives. We know with great confidence that the Queen of the Green Scapular will not rest until she secures the gift of Final Perseverance for all those living souls clothed in her Green Scapular. She will beckon her Divine Son for, not only the spiritual conversion back to Thee, Eternal Father, but also physical cures of those whose mission on this earth requires Thy Son's gift of a physical healing. Most holy Lord, Father Almighty, if it be Thy Divine Will, allow me to serve Thy Son and His Mother daily in this struggle against the infernal enemy, where together in Communion of Thy Son's Divine Mercy, we may bring forth the reign of the Immaculate Heart by placing the entire world on Her Green Scapular. Amen. "Immaculate Heart of Mary, pray for us now and at the hour of our death. Amen."